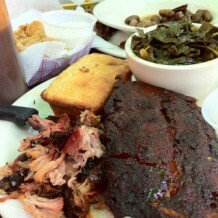 Home » Adventures, Tours and Trips » Oh, Atlanta! 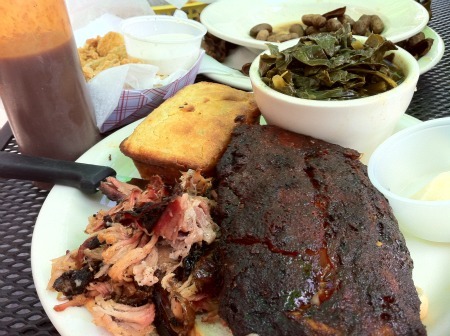 BBQ by Fox Bros. in Atlanta – YUM! Last week, I was in Atlanta, selling wine. I am the Director of Sales & Marketing at J. Rickards Winery and part of my job is working with distributors. We recently started working with Big Boat Wine Company, a dynamic women-owned-and-operated distributorship, located in Atlanta, Georgia. These women work hard, but they play hard too. I went out there to “kick off the brand,” which means a couple days of “ride-withs.” A ride-with is when a distributor (or one of their reps) schleps you all over town, in and out of wine shops, grocery stores and restaurants all day long, and into the evening, so you can pour your wine and tell your winery’s story to all of the accounts you visit. It’s fun, but tiring – there’s a lot of talking, tasting and schlepping going on. Believe it or not, I’m actually a bit of an introvert – at the end of one of these types of days, all I want is to do is to curl up in my hotel room, order room service and watch a movie. And have a couple glasses of wine (or gin & tonics – that’s my on-the-road cocktail of choice). I left San Francisco on Monday morning. Since I live in the backwoods of Western Sonoma County, I had to get up at 4AM and be on the road by 5AM to make my 8:30AM flight out of San Francisco International Airport. My wonderful sweetheart Tim actually got up to make coffee for me at 4AM, so I could be alert (somewhat) for my drive. I LOVE that man. Got to the airport with time to spare, then had to cool my heels in a mile-long security line. No fun. Finally boarded my plane and landed in Atlanta several hours later. Tuesday morning at 9:15 sharp, I started my first Atlanta workday. April McCollum, blond dynamo and Managing Partner of Big Boat Wines picked me up at my hotel and we were off and running. She took me all over Atlanta – we were in and out of at least ten different stores and restaurants. I told the J. Rickards story and we sold a LOT of wine. One of the things we did was a “guess the wine” game. People loved it! Here’s the scoop on that – my boss, Jim Rickards, is a well-known grape grower and has been selling Cabernet Sauvignon grapes to Silver Oak Cellars (among others) for several years. Silver Oak Cellars is a well-known producer of fine, high-end Cabernet Sauvignon wine. J. Rickards Winery also produces Cabernet Sauvignon wine from the same vineyard that supplies Silver Oak Cellars, but we sell ours for about half of what they sell theirs for. Soooo – the guess the wine game featured one bottle of Silver Oak Cellars Cabernet Sauvignon and one bottle of J. Rickards Cabernet Sauvignon, “blind tasted” from brown paper bags. The results were interesting, to say the least, and we sold a lot of wine because of it. My work day ended at 9PM, after a couple of hours spent at a super hip restaurant’s bar, where we tasted a handful of exotic cocktails and nibbled on several delicious appetizers. It was a good (12 hour) day. Wednesday, I worked with Leigh, who describes herself as “tall, short hair, looks like a man.” This is an apt physical description of Leigh, but she didn’t add that she has a wickedly funny sense of humor and a big, soft heart. She is also a wine-selling machine. Leigh used to be the lead singer for a Rockabilly band (like me), is a total wine geek (like me), has similar political and religious beliefs and she grew up riding horses like I did. We became instant friends. We hit a few accounts and played “guess the wine” with them and subsequently sold some serious wine. Then we stopped for lunch, which was the highlight of my trip. Leigh took me to Fox Brothers BBQ, where we stuffed ourselves silly with boiled peanuts (pronounced “bulled pie-nuts”), fried pickles, cornbread, collard greens and the some of best BBQ ribs I’ve ever had, all washed down with ice cold beer. Oh yeah! After the lip smacking and hand washing subsided, we hit the road again and visited some more accounts (and sold more wine). We were both too full from lunch to do dinner at the end of the day, so she dropped me off at my hotel. Thursday morning, I ate breakfast at The Silver Skillet, which is an institution unto itself. It’s known for “the best breakfast in Atlanta.” My server was a slight, bleached-blond sixty-something gal that spoke with a Southern accent so thick that you could damn near cut it with a knife. She called me “hon” and served me pork chops (served “frahd” or “gre-elled”) with scrambled eggs, grits and gravy. The coffee was weak (I like my coffee STRONG), but the food was great. Shortly after breakfast, I jumped on a plane and flew home. If you visit me in the tasting room at J. Rickards in the next few days and notice I’m speaking with a Southern drawl, don’t worry too much, it’ll pass, but I’ll definitely be headed back to Atlanta for more Southern hospitality (and BBQ) in the near future.